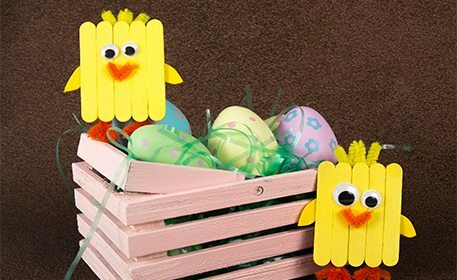 Craft a pair of Easter chicks from craft sticks. 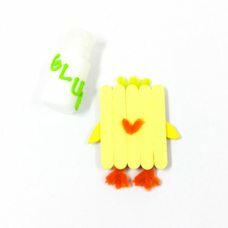 Make different sized chicks with different sized sticks or make them miniature like we did! 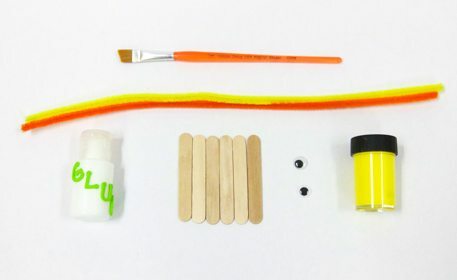 Line up 5 mini craft sticks next to each other, then glue another mini craft stick diagonally on top of them. 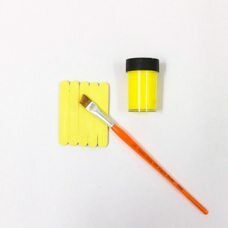 Once dry, flip over and paint yellow. This will be the chick’s body. Cut a 2” piece of yellow fuzzy stick. Fold into a zigzag shape. Glue onto the back top of the chick’s body. 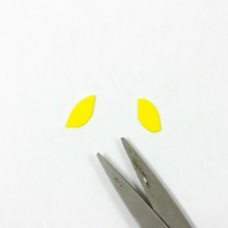 Cut 2 teardrop shapes from yellow craft foam. These will be the chick’s wings. 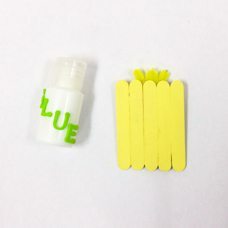 Cut 5 pieces from an orange fuzzy stick. Create 3 v-shapes from 3 of the pieces. 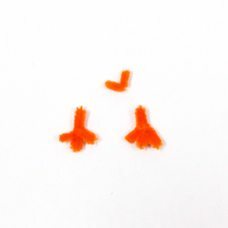 Twist 2 of the v-shapes around the 2 remaining straight pieces to create the chick’s feet. Glue the wings, beak and feet to the chick’s body. 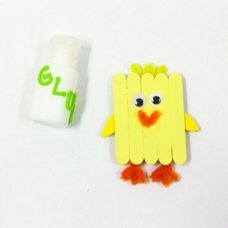 Glue on mini wiggly eyes so the chick can see!